The Italian people as every foreigner know well, are really traditional when it comes to food. Pizza and lasagne have to be made so and so, the same for other delicious dishes coming from our great background. But the truth is that recipes are various and also the most sacred ones can be changed and still be tasty! In this kind of open-mind attitude, let’s talk about Pesto then! 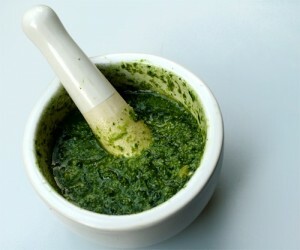 A fresh pesto is not only the world-famous Pesto alla genovese! You can make it with a different choice of ingredients, starting for example with the herbs right from your garden! To make a delicious pesto and tossing with pasta or spreading it on bread, here is some of “alternative” recipes to the Genova’s “big brother” Pesto. The directions is similar to the ones you follow for the “normal” pesto recipe: you need to blend the garlic, the basil, the parsley, the spinach and the oregano with the pine nuts, the Parmesan cheese, then season with salt, pepper and olive oil in a blender until the mixture will be smooth and similar to a pastry, a really thick one or a really waterly one. It depends on the amount of olive oil you drop in the mixture and of course on your taste! Try also to substitute the pine nuts with almond or with pecans! It will be worthy to try all the choices! And also try to add lemon juice to make it smoother! Alternative pesto are all over the world: just go beyond the tradition and start to challenge yourself with these original and fantastic alternative ingredients. This entry was posted on Saturday, April 14th, 2012 at 5:36 pm	and is filed under Italian Recipes and Food. You can follow any responses to this entry through the RSS 2.0 feed. You can leave a response, or trackback from your own site.